Note how the flowers of the American Redbud resemble those of a pea or bean. One of the most beautiful trees you will ever see anywhere is native right here in the Ozarks. 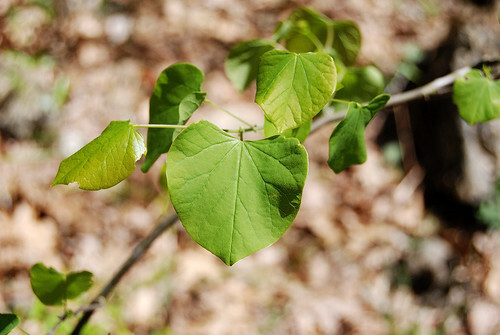 The American Redbud is found in forests, along fence rows, in fields, next to streams, and in yards all over America. 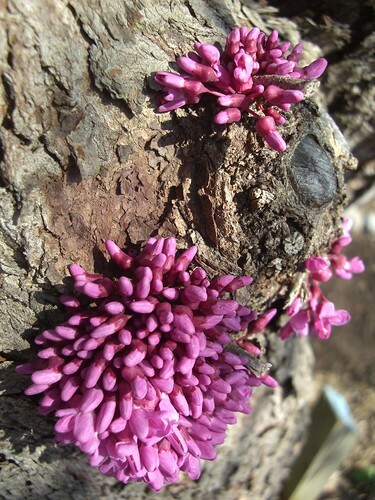 It thrives in a wide variety of habitats and is resistant to diseases that cripple other ornamental trees. It blooms in the early spring, the branches covered with small 1/2″ pink and magenta flowers that bloom before the leaves emerge. White flowered forms do exist. Late in the summer flat brown seed pods about 3″ long will form. Redbuds grow rapidly when young but mature into gnarly and interestingly shaped trees that seldom get above 20 feet. The bark is cocoa brown and rather flaky looking. Flowers of the American Redbud are a beautiful shade of magenta. Redbuds are members of Fabaceae, the pea and bean family. That means they are a legume. (If you’re thinking it’s odd to see a legume tree, another common leguminous tree is a Honey Locust.) The flowers are edible and make an interesting garnish to toss in with your salad. I found the blooms to taste a little bitter but mostly like raw peas. 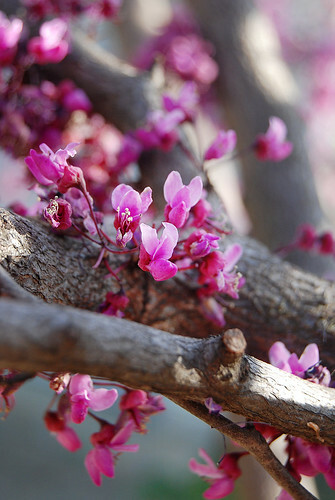 An interesting feature of the redbud tree is that the flowers can bloom directly from the trunk of the tree. This quality is called cauliflory. The flowers of American Redbud often grow directly from the trunk, a quality known as cauliflory. I’m always fascinated with the origins of botanical names. They usually describe the plant or give a clue of the history of the species. Redbud is called Cercis canadensis. I can’t find any explanation for the word Cercis, but I have a mystery. The Polish word for heart is “cerca”. 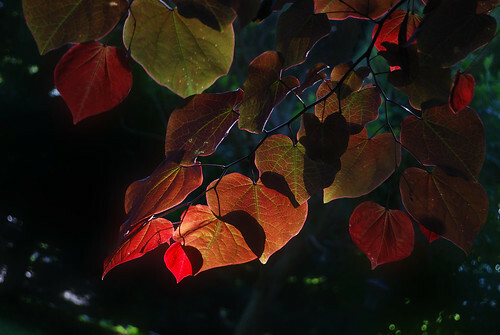 And the leaves of the redbud tree are heart shaped. Coincidence? I’d sure like to know. I suspect both words came from the same source. Redbud does have several popular ornamental varieties. The photo below shows the wonderful maroon color of the variety known as “Forest Pansy”. This picture was taken in my front yard. It’s a gorgeous tree. Note the shape of the leaves. Like a heart. Note the heart shaped leaves of the Redbud tree. This entry was posted in Trees and tagged American Redbud, Cercis canadensis, Flowering Tree, Pink on March 30, 2012 by Ginger.